Considerable amount of utme applicant, have be asking us how do image of jamb waec result upload looks like, how to confirm if the o'level result has be succefully uploaded. Perhaps someone must have told his/her guaidance that he/she has uploaded the o'level result into jamb portal, and they want to confirm or verify it, who knows? 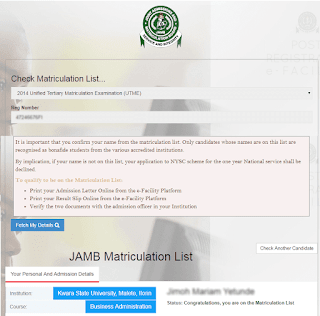 What is JAMB WAEC Result Upload? This is the uploading of scan copy of UTME applicant Ordinary Level Result, also called the O-level into the Joint Admissions and Matriculation Board Portal. The o'level result comprise of waec, neco, and nabteb. One of the prequisite for a candidate to qualify for admission he/she must upload his/her o'level result into jamb portal. Here Is What Image of JAMB WAEC Result Upload Sample Looks like. For the sake of answering this question, here is a screenshot in jpeg format of an image of jamb waec upload that is succesfuly. A quick entry on Google will bring out a lot of results in Google Images. What is jamb uploading of o'level result?